No material is kept in inventory, Delivery from commercial mining and stockpile yards at discount. $ 9 Select Fill Dirt (A-4)……………………………….. 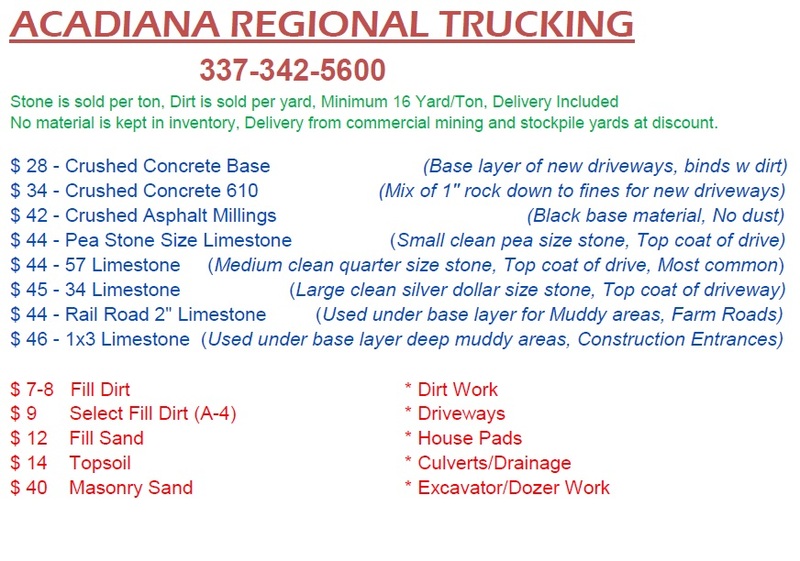 This entry was posted in 337-342-5600, abbeville, broussard, Bulk Material, Clay, Compactable Dirt, Dirt, dirt hauling, duson, Fill Dirt, Fill Dirt Delivered, Gravel, Lafayette, Limestone, Lowest Prices, mason sand, materials, maurice, milton, new iberia, rayne, Sand, Sandy Fill, scott, Select Dirt, Topsoil, youngsville and tagged (337) 342-5600, broussard, cheap dirt, Clay, compactable dirt, Dirt, dirt hauling, dirt work, Dump Truck For Hire, fill dirt, Lafayette Louisiana., Lowest Prices, sand, sand and gravel, Sandy Fill, scott, Stone, Topsoil, youngsville. Bookmark the permalink.